It is easy to look back over the twentieth century and witness the rise and fall of particular styles of interior decoration. However, in placing ourselves in the shoes of those Milwaukeeans in 1907, we are able to see how the revolutionary interior designs of George Mann Niedecken must have appeared shocking, strange, and yet, intriguing. As outside of the norm as some of his creations appeared, Niedecken, who is often defined by his work with Frank Lloyd Wright, was able to garner a substantial list of clients from Milwaukee’s upper social strata. This retrospective of his works explores his commissions in the greater Milwaukee area as developed relative to the space, the client, and the designer himself. Having attended school in Europe during a pivotal period in the International Design movement, Niedecken brought a breath of fresh European air to Milwaukee’s stagnant interiors. He was able to bring back to Milwaukee those tools that he explored while on the Continent and to interpret them for eager clients wanting the new and, in many cases, the avant-garde. One of his first major commissions was for the newly widowed Emma Demmer, who had just completed her new residence on Wahl Avenue in 1907. The exterior, a very correct shingle-style Queen Anne, did not betray what Mrs. Demmer had commissioned Niedecken to execute by way of interior design. Over the course of the next three years, Niedecken committed himself to creating one of the most fantastic and thoroughly modern interiors in the city. Niedecken designed the furniture, rugs, leaded windows, and light fixtures based on the principles of the Vienna Secession, and all in cutting-edge fashion. What her reaction was to this completed interior will never be known. Mrs. Demmer sold the house in 1912. The Demmer commission is nonetheless an important watershed in Milwaukee interior design, and led to a who’s who of other Milwaukeeans expressing their interest in the talents of Mr. Niedecken. The exhibition will also delve into his work with the Pabst, Bogk, Harnischfeger, and Mayer families, among others, and how he employed different architectural modes for each project. His work and relationships with other Milwaukee architects will also be discussed. This exhibition celebrates the final phase of a project funded by The Mae E. Demmer Charitable Trust to fully catalog and organize the George Mann Niedecken archive at the Milwaukee Art Museum. Researchers will enjoy improved online finding aids and an expanded second edition of the seminal catalog The Domestic Scene (1897–1927): George M. Niedecken, Interior Architect, formerly out of print. This exhibition was organized by the Milwaukee Art Museum, curated by John C. Eastberg, senior historian at the Captain Pabst Mansion, and coordinated at the Museum by Liz Flaig. 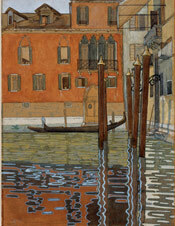 Thursday, April 17, 5:30–8 P.M.; lecture, 6:15 p.m.
Free with general admission. No reservation required. Tuesday, May 20, 1:30 p.m.
Tuesday, July 8, 1:30 p.m. The Villa Terrace Decorative Arts Museum is hosting two complimentary exhibitions this spring: Hollyhock House and Olive Hill: Frank Lloyd Wright and Edmund Teske and Louis Sullivan’s Decorative Terra Cotta Tiles,April 19–June 15, 2008. The museum, located at 2220 North Terrace Avenue in Milwaukee, is open Wednesdays–Sundays, 1–5 p.m.